In 2004, with the appointment of a new young Musical Director, Eliot Darwin, the Band decided to enter the contest arena again after an absence of almost 10 years, and so the Band took to the stage at Bradford for the 2005 Yorkshire Area Contest and were thrilled by achieving a third place. The year of 2006 was to prove very eventful for Dodworth and Eliot. Once more the band went to the Yorkshire Areas and fuelled by our placing the previous year and a lot of hard work, the Band became Yorkshire Area 4th Section Champions, then became Tameside Open Champions and rounded it off by becoming Fourth Section National Champions. 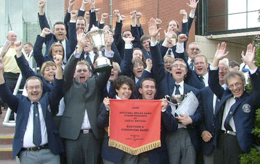 Dodworth’s first outing for 2008 was the Butlins Mineworkers Championships and newly promoted to the Second Section we obviously wondered how we would cope in a higher section and we were delighted by a Second place. This gave us a good boost of confidence to go to The Yorkshire Areas in March but the 7th place didn't seem to reflect our performance on stage or the feedback from the audience. As well as the successes on the contest stage Dodworth Band has also had a number of significant events over the years since its association with Eliot as MD. Local conductor and arranger Nigel Horne (who incidentally introduced the Band to Eliot when we were without MD in 2004) needed a recording of his arrangement of The Ash Grove which was to be used as incidental music for the "River Cottage" series with Hugh Fearnley Whitingstall. Dodworth rehearsed and recorded the music for broadcast on Channel Four. Other recordings and broadcasts were to follow for the BBC in 2006 and 2007 when we were invited to perform at the annual BBC Radio Sheffield Christmas Carol Concerts. In 2009 the Band stepped into a world which was less familiar when it was asked to record two brass band arrangements of songs by the Brighton based Indie band, The Maccabees. Dodworth Band continues to carry out a variety on concert engagements throughout the year and in recent years it has been privileged to be asked by the Rotary Club of Sheffield to take part in their Music in the Park charity event in Sheffield Botanical Gardens. Our first performance there was in 2010 and this has resulted in repeat invitations in 2011 and 2012.